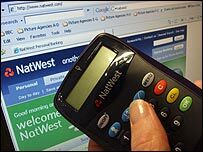 Hundreds of thousands of Royal Bank of Scotland and NatWest bank customers are being given a new security device to protect their online bank accounts. People who set up payments from their accounts, such as direct debits, are being sent small debit card readers that look like calculators. These generate a new code each time they are used, which must then be typed in to the banking group's website. The new system is similar to Barclays' Pinsentry introduced earlier this year. Several hundred thousand card readers have been sent out since May, to personal and business customers with RBS and NatWest online accounts. Initially the readers are being targeted at people who frequently set up new payments from their accounts, or who think they are likely to do so. From next year, any customer who sets up a new payment will be sent a reader automatically for use in the future. "A card reader is not needed to log in to online banking or making payments to existing third parties, it is only required to set up new payees," said an RBS spokeswoman. The extra security measure, designed to stop so-called "phishing" frauds, works in the following way. A customer will put their debit card into the reader, along with that card's current Pin code. They will also have to enter another eight digit code which has been displayed on the RBS or NatWest online banking site. When that has been done, another unique "response" number will be generated, which must then by typed into the online account to set up or authorise any payments from it. "We see it as the most advanced proposition for security at the moment," said the bank's spokeswoman. Barclays and RBS/NatWest are the first two banks in the UK to adopt this extra online security. The reader is a standard piece of equipment, identical to that issued by Barclays to its customers. As such it can be used to read a Barclays card, assuming the customer or someone else in their household has an online account with that bank as well.